Upper Stone Street, looking north [back towards the Town Centre]. Wheatsheaf, Loose Road [where the routes to Sutton Road and Loose divided]. Brishing Lane, just about to turn into Bell Road, on the Park Wood estate in Maidstone. Wallis Avenue, Park Wood Estate, during its construction. Photographs 373, 374, 375 and 174 are of what might be termed the Maidstone Standard Car. They were Sunbeam Ws with Northern Counties 56 seat bodies. South Shields and Newcastle Corporation had some almost identical vehicles. Maidstone had three Daimler motor buses with the same bodywork [bit with half-cabs of	course]. Further comment. The arrival in 1946 of nose 62-73 permitted the [eventual] withdrawal of the 17 original six-wheeled trolleys dating from 1928 [Ransomes, Simms & Jeffries] and 1930 [English Electric]. No's 83/84, ex-South Wales Transport, while the same as 62-73 were inferior from the date of arrival. Despite much effort, they left the fleet early with the Hastings arrivals. The Hastings system was announced for closure on one day, and being local to Maidstone & District Head Office, two of the Corporation staff were in Hastings the next day to chose the best of the fleet. Other buyers came a few days later and were disappointed to find the best had gone. It always seemed strange seeing the green trolleys in the Corporation [brown] garage. They never ran in service until they were re-painted. More on bringing the Hastings trolleybuses to Maidstone. 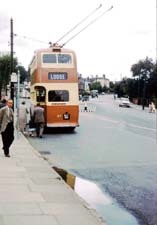 Maidstone Corporation paid for new trolleybuses up front, with no finance involved, as they did for every vehicle, motor or trolley, until the trolleys were replaced in 1967. 1959 - from Nottingham Avenue to Park Wood [running in a terminal loop via Wallis Avenue, Brishing Lane and Bell Road back to Wallis Avenue]. 1963 - extended in Park Wood via Wallis Avenue to its junction with Bell Road [the new terminus being Park Wood Parade]. This remained the terminus until the system was dismantled. There was a 1950s MCTD internal proposal to extend the Sutton Road route out to Langley Cross Roads, turn right along the hills to Coxheath Cross Roads, returning to town via the Loose route. Maidstone and District took an understandably dim view of that idea and it came to naught. 1947 - Barming [Fountain Inn] to Barming [Bull Inn]. This extension took the trolleybus line beyond the Borough Boundary - by all of 600 yards! The originals of pictures in this gallery have deteriorated over time. The two Brighton BUT trolleys which came to Maidstone most unusually kept their Brighton numbers [51 and 52] because they fitted neatly into the Maidstone series. When they entered service they were regarded with some awe as the quality was some way ahead of Maidstone's own workaday vehicles. The ceilings, downstairs at least, were covered in some decorative material [was it called Alhambrinol? ], much better than Maid stone's own painted metal. No bare bulbs for lighting either! They were not, however, a great success; the spares were hard to come by, so they robbed Peter to pay Paul, which meant that only one was in service at any time. Conversely the Llanelli and Hastings trolleys were Sunbeam/Karrier Ws, the same as the rest of the fleet.